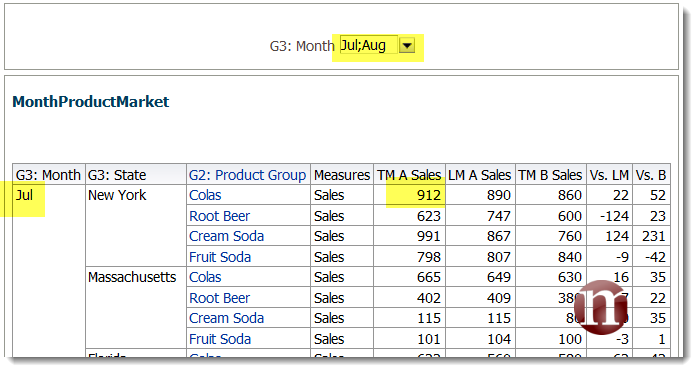 OBIEE RPD – Have a Time dimension. This is usually tagged once imported. 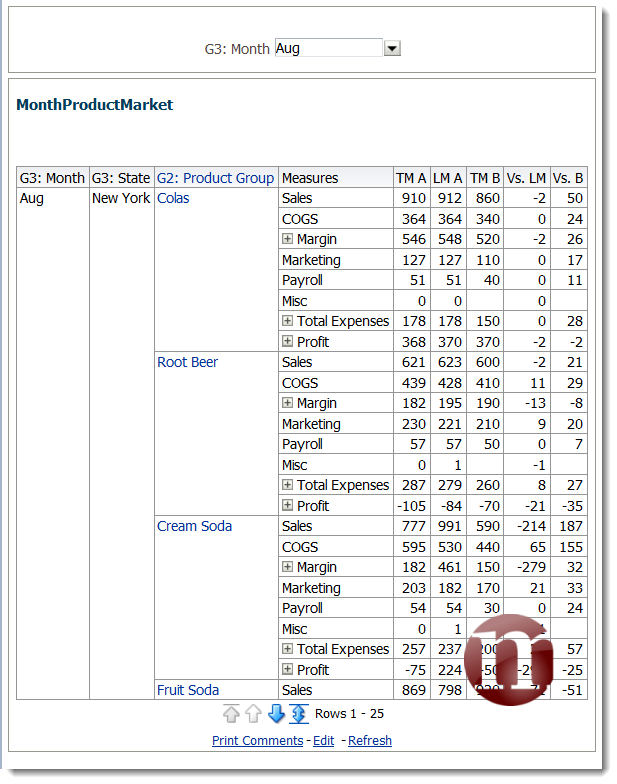 OBIEE RPD – Have your Account or Measure dimension tagged as Measure Dimension and Value as Hierarchy Type. Since the Essbase and RPD is now done. Let’s take a look at Answers and see why these points are considered as best practices. Creating a new Answer or Analysis report, everything becomes extremely clear. 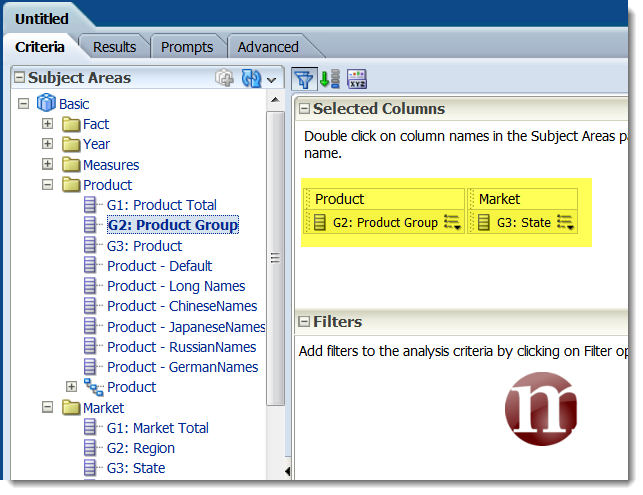 If we use Product Dimension and Market Dimension as an example, you will see that it states for every column which generation it is and giving it meaning. So just by looking at the Column names, it becomes apparent to why we give Generation Names in such a way. 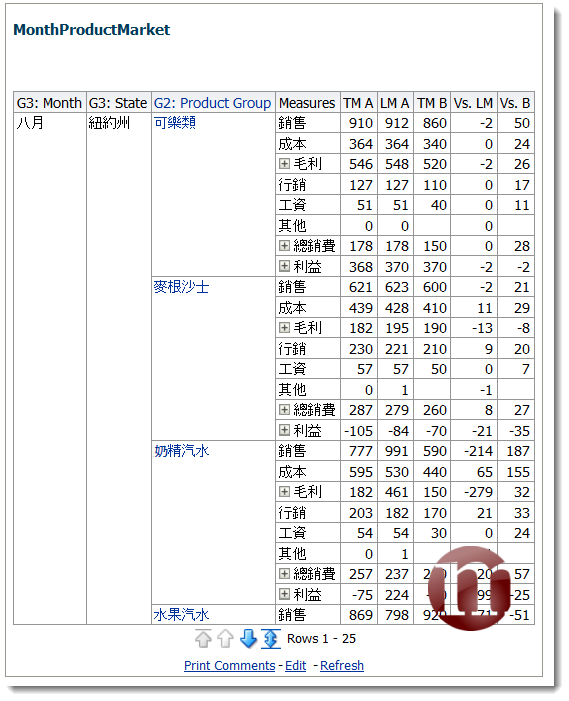 Adding G2: Product Group and G3: State to the report. And looking at the results. The results also clearly states which generation you are in. If we replace Product Group with the hierarchy. And going to selection steps, choosing “Then New Step” -> “Select Members based on Hierarchy”. 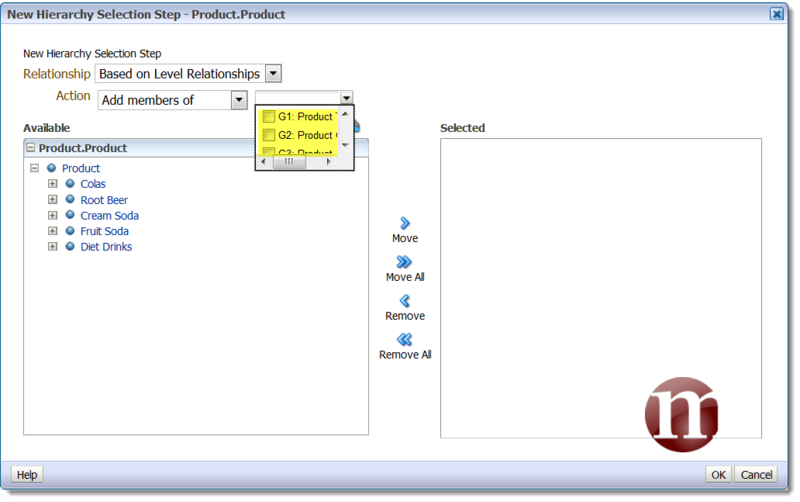 From relationship, if you choose “At Specified Hierarchy Level” or “Based on Level Relationships”, you will be able to see the generation names again. This is extremely useful when you have dimensions that go up to 5-6 generations. 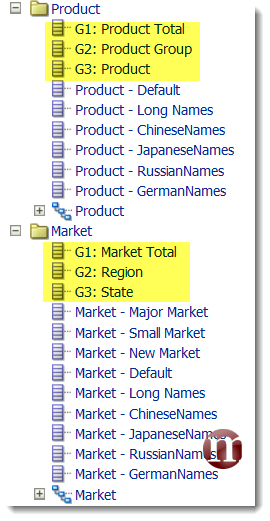 Please do ignore the naming convention in OBIEE, since “Level” isn’t the same term as Essbase Level. If they changed the wording to Hierarchy Generations or Generation Relationships, it would have been much clearer for Hyperion users when Essbase is used. 2. 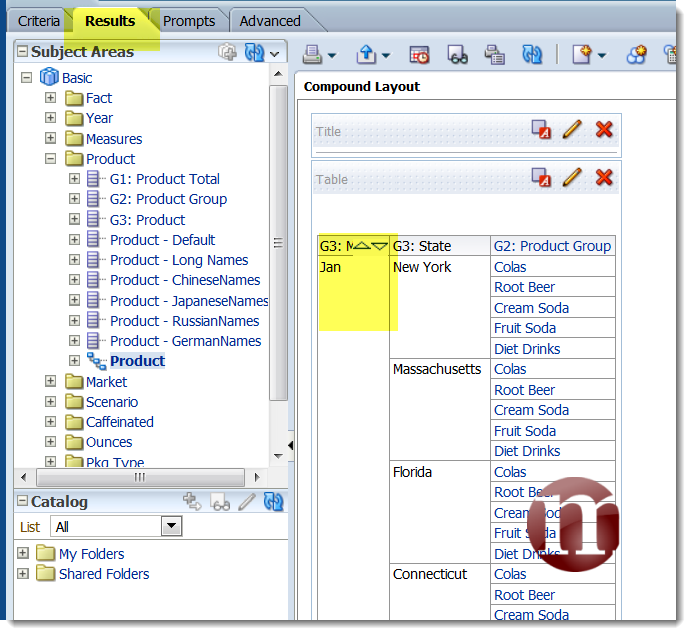 Essbase EAS or SubVar Manager – Use Essbase for Substitution Variable & 5. 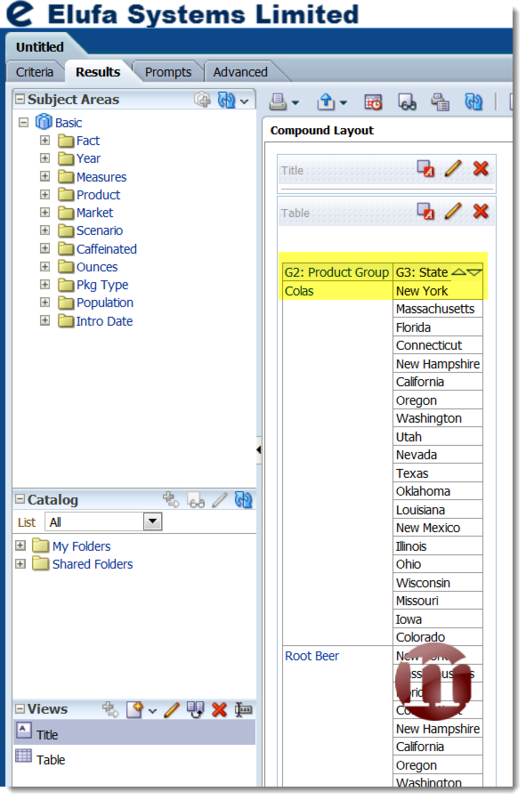 OBIEE RPD – Have a Time dimension. This is usually tagged once imported. 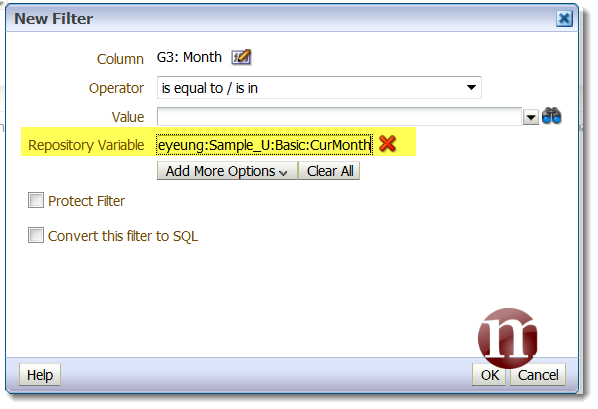 Since we’ve created a subsitution variable in Essbase called CurMonth, we can now use it for OBIEE, SmartView, HFR, Dodeca, whatever your end tool is. Add G3: Month to the criteria. If you view results, you’ll see Jan which is the first member of Gen3 in the Essbase outline. Go back to criteria and add a G3: Month filter. 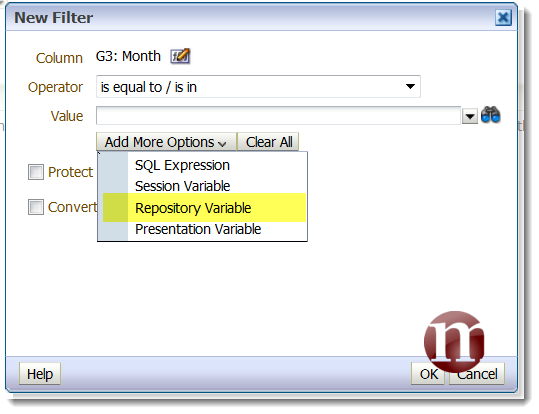 Choose Repository Variable from Add More Options. Now fill in details “Hostname:AppName:DBName:SubVarName” and for my case it’ll be steveyeung:Sample_U:Basic:CurMonth. If you view Results page, you will only have Aug member for G3: Month. This is the substitution variable set in Essbase. Go back to criteria and instead of using Repository Variable, we’ll try out prompted. Now save the report. I’ve named mine MonthProductMarket. Our next step is to create a new dashboard prompt. Choose Column prompt for “Year”.”G3: Month”. For Default selection, choose Server Variable then fill in “Hostname:AppName:DBName:SubVarName”. As a result, you’ll get a default selection of Aug. Create a new dashboard and put the prompt and report in the dashboard. Your report will now read from the dashboard prompt with Aug as default using substitution variable in Essbase. Using the same report created, we’ll add a few things to it. 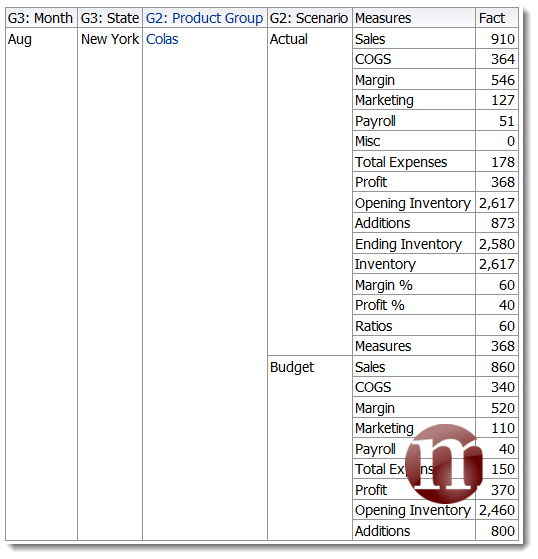 “G2: Scenario”, “Measures” and “Fact”. Looking at results, you get this kind of thing. Say you have a requirement of looking at This Month Actual Sales, Last Month Actual Sales, This Month Budget Sales and Variances. Go back to Criteria, remove G2: Scenario, then add another 5 “Fact”. Just a kind note, when you use AGO function within Answers, you’ll need to use the time hierarchy. So it’s “Year”.”Year”.”G3: Month”. Save it and go back to the dashboard. You’ll have your results. 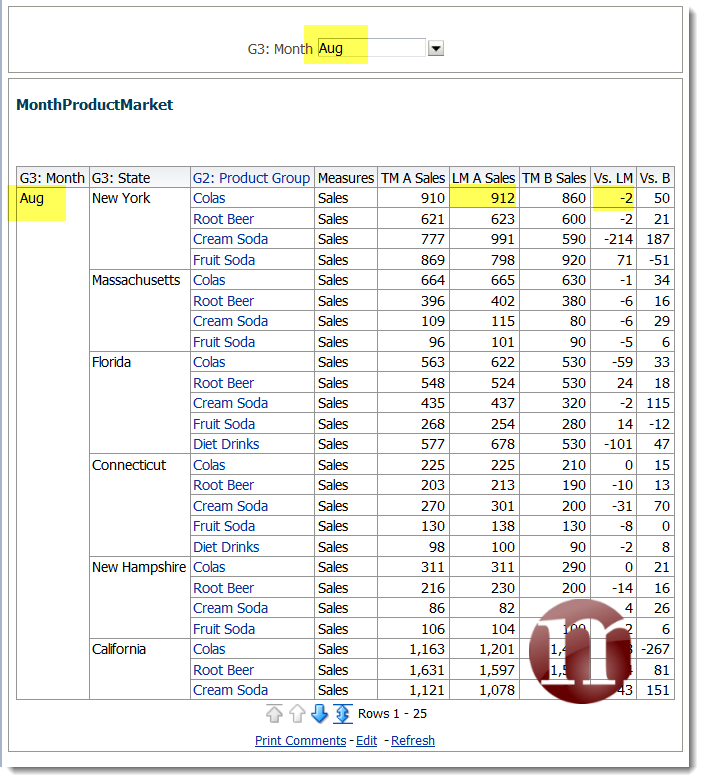 Change the prompts to Jul; Aug; and you can verify that your last month numbers are correct. To conclude, filtering within the fact gives you a lot more flexibility than using flattened measures. Go back to the dashboard to take a look. Let’s go to EAS to modify the outline a bit as to demonstrate what Value Type will do. 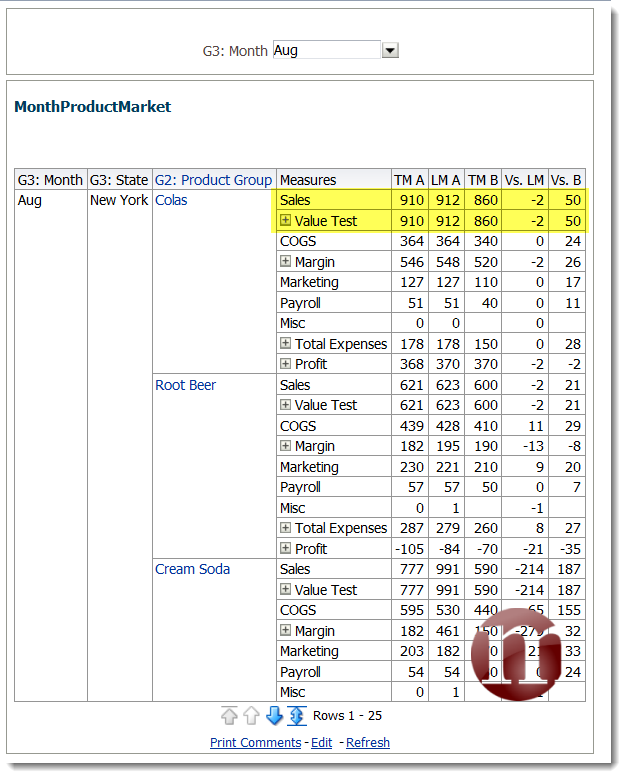 Add a dynamic calc member called Value Test and have Sales under it. Then do a all data restructure by saving the outline. Go back to the dashboard and refresh. You see how you get Value Test member and Sales member right away? This is because of the Parent Child relationship setup in the RPD. In all other cases, you usually have to add another Generation to the Physical Layer in the RPD. For dimensions that you see will have extra layers, levels or generations, whatever you call it, we recommend the use of Value Type. I will not go through 7 and 8, since the benefits have been seen during the last few topics. I also won’t go through Uncheck Cacheable since you should have seen the benefits during the last restructure. 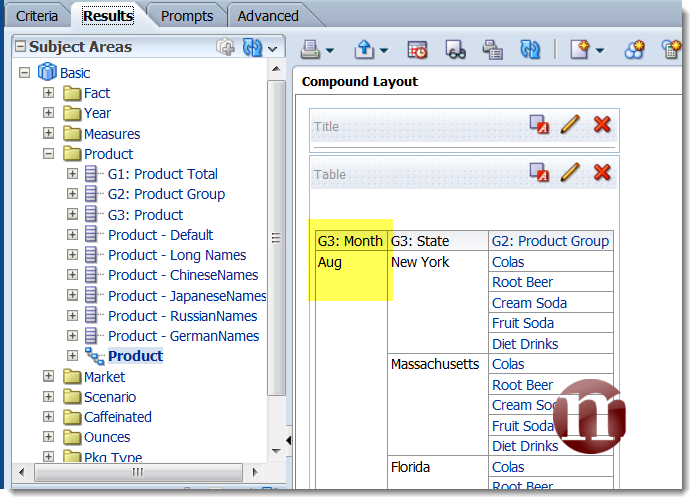 With Essbase, you can have different Alias Tables. Remember we have an OBIEE_AUTH table? Inside, there’s a column called Web_Language. 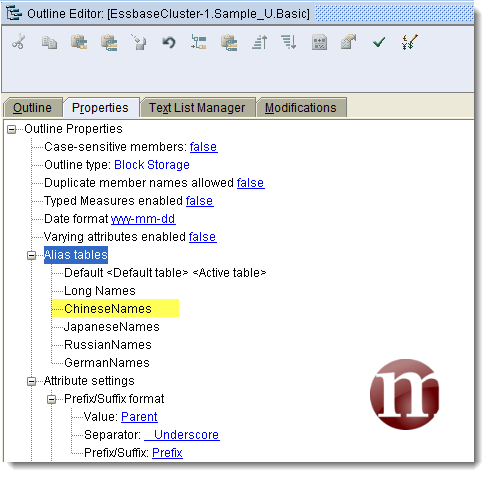 It was default previously, let’s change it to ChineseNames because that’s one of the Alias in Essbase. Log out and log in OBIEE again. View the Dashboard and check out how we’ve changed languages. In Essbase, when you pass Member Names, you will have the freedom to change Alias Names without having to modify anything since you will always use Alias for display purposes. So that’s it for all Essbase OBIEE Integration Tips and Tricks. By the way, the translation for Cream Soda in Chinese is extremely wrong, if I translate this to English, it means Milk Essence Soft Drink. They better find a good translator instead of using Google Translate. 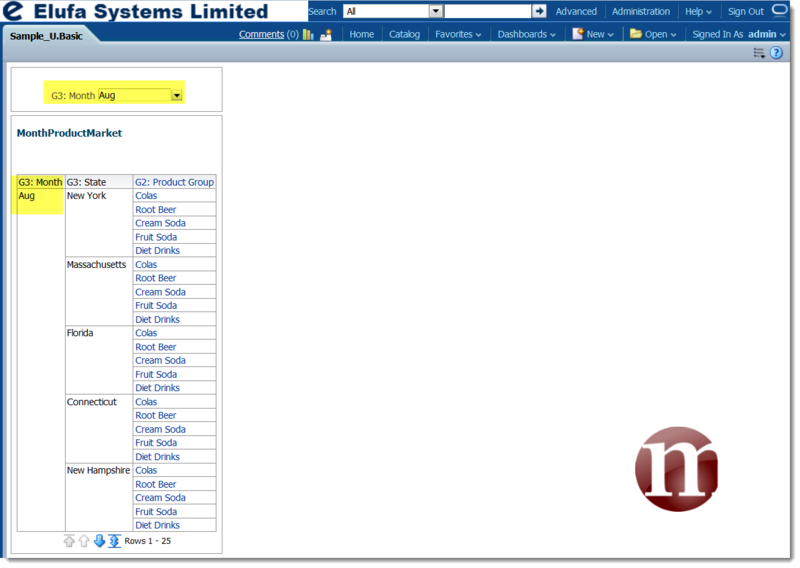 Thanks Steve, very good article on OBIEE-Essbase. If we have DEV, QA and PROD environments, instead of maintaining 3 copies of same variable with 3 different host names, can you suggest an alternative or best practice? Thanks for the compliments!!! Right, I suppose you are mentioning OBIEE since the syntax is for OBIEE. OBIEE syncs these from Essbase directly, hence I suppose apart from a setup job, you don’t have anything else to do. Just tell it how often you need to sync. On the Essbase side of things, either you can write a MaxL or write an Excel VBA program or even use SubVar Manager from AppliedOLAP. These are all good ways to maintain Sub Vars. Do feel free to contact me if you need more info or me to elaborate on a specific point. I didn’t want to write too much until I have a better idea what you are trying to achieve. Thanks Steve. Yes, I was referring to Essbase Sub Variables in OBIEE RPD. It is a painful process to update reports/dashboards with 3 different variable names in 3 environments. I’m trying to keep only one variable (LastYr) in RPD, instead of 3 variables (DEV/QA/PROD). Looks like I need to look at options on Essbase side to rename these variables. This way, you maintain 1 set of sub var and 1 set of environment variables.